Hair products to repair, prevent or eliminate hair breakage! Stop breaking, snapping, rough & frizzy hair! Hair Vitamins - Vitamin supplements can go a long way towards adding strength, resilience, flexibility and shine. Daily nutritional supplements developed specifically for hair provide B-complex, Niacin, Biotin and many nutrients and minerals needed to reduce breaking. Moisturizing Shampoo - Face it, dry or brittle hair is often caused by lack of moisture. Shampoos rich in panthenol and Emu Oil are ideal for hydrating while reducing frizz and splitting. Keratin-infused, Protein-based Conditioner - Proteins, keratin, and natural oils help reduce snapping and allow combing and brushing without pulling and tearing due to tangles. They also add smoothness, shine and inhibit frizz due to humidity. Understanding why hair becomes weak and snaps or rips is important to understanding prevention and repair. Reasons for hair breakage are many, but mending and repairing can be effectively done with proper treatment. Brittle hair often suffers from hair breakage which can be repaired. Our best and most popular hair breakage treatments now in a convenient and easy-to-use kit. Voted "Best" by our customers and often recommended by our staff, you get the the most popular products used to repair, treat, and protect against breaking hair, frizz, damage from lost moisture, and damage caused by styling tools and chemical treatments! Breaking hair is due to several causes - many of which can be controlled, fixed, mended or repaired. Most often breaking occurs because protein bonds in the hair shaft have become weakened...allowing them to break or split - much like an old, dry piece of bamboo. While the bamboo is alive, hydrated and growing, it is flexible, thick and strong. If cut-off from nutrients and moisture, it becomes brittle, hard and snaps easily...same with your hair but on a microscopic level - the effects are the same. So, what causes breaking Hair? Generally, causes can be broken down into categories of nutrition, moisture and damage. The follicle sheath/shaft is comprised of keratin and protein bonds that create the outside structure. Amino acids, vitamins and minerals are needed for these bonds to develop and to avoid weakening. Likewise, the nutrients are required by the root/papilla to grow the follicle longer and stronger...much like fertilizer on a plant (think MiracleGro). Secondly, again similar to a plant, water, moisture and hydration are key and vital. Without hydration, the follicle and its cuticle become dry, weak and brittle. Lack of hydration externally (topically) or through ingestion leads to dryness. Finally, damage - either physical or via lack of nutrients or moisture can greatly accelerate or create breaking. Heat via flat irons, curling irons or dryers can strip nutrients and fluids. Chemical treatments, in particular, break down the protein bonds and reshape them - this is how you straighten or perm. Color treatments strip nutrients and often makes hair brittle, frizzy and prone to breakage. Other damage can come from external or physiological causes. Changes in hormones (menopause), medicines, contraceptives, and stress can all play a factor. A hair breakage treatment works to address each of these issues. Vitamins for hair breakage re-balance nutrients internally to ensure proper amino acids, Biotin, Niacin, B-12, B-6,7 are delivered to the scalp and hair. Protein conditioners help rebuild the follicle shaft externally with bond-enhancing botanicals. 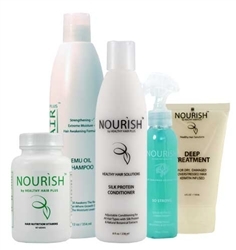 Shampoos with ingredients such as Emu Oil penetrate moisture deep into the hair. And leave-in conditioners can help protect from heat, chemicals, and sun damage - all providing protection from hair breakage and weakening. While all breaking cannot be prevented, there are things you can do. If you use a lot of heat, a "thermal protector" can be helpful. Using heated styling tools/appliances diminishes moisture in the follicle strands making them susceptible to humidity as well as weakening the protein bonds that keep hair flexible and smooth. Thermal protectors provide some shielding from heat and help lock-in moisture. Speaking of heat, if possible, use sparingly.